What Makes Chicken Breast Taste So much Like Louise Prepared? Breaded Chicken Breast Louise's Style always tastes great! And, chicken was one of Louise's best meals. No matter which chicken entree you choose to prepare and eat, you will always love Louise's breaded chicken, and, she enjoyed every bite too. This meal takes a basic meat and makes it look and taste like you slaved in the kitchen all day. This meal is a quick one that is tasty all the way to the end due to using her home made bread. But don't let Louises home made bread stop you from cooking one of her favorite chicken entrees. Remember, use the spices to taste, so if you like it hot, add more pepper! 2 Cups Bread Crumbs (Broken from Louises bread by hand. See Bread Recipe). You will need a 13" by 9" by 2" Baking dish. Pour oil in bottom of dish just to lightly cover. 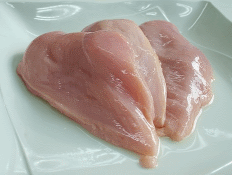 Wash chicken and cut any unwanted fat. Put oil in dish then place the breast on the oil, then turn it over and place the other side in the oil. Sprinkle all the bread crumbs over the chicken and season to taste with the salt, pepper, sweet basil and garlic powder. Place pads of butter on top of chicken (about two per piece) and bake in a 350 degree oven for 45 minutes to an hour. Add salt and pepper to taste but use sparingly. Fresh chicken is best. Bone in chicken can be used or if you prefer dark meat thighs and legs are great. Thin breast meat will cook faster so monitor the baking process after 20 minutes to keep from drying out. Additional butter will make the bread crumbs tastier and add additional buttery flavor to the chicken while keeping the chicken moist. Cover with Aluminum foil to keep moist while baking. You can cut cooking time by raising the baking temperature to 370 degrees and monitoring at 20 minutes. Olive Oil makes the chicken have a bit more flavor. Glass baking dishes are easier to see through in the oven and easier to clean. See how to make Louise's bread that tops her Chicken Breast recipe. Return to Easy Everyday Cooking Recipes from Louise's chicken breast.